For many Christian churches, Palm Sunday, often referred to as “Passion Sunday,” marks the beginning of Holy Week, which concludes on Easter Sunday. 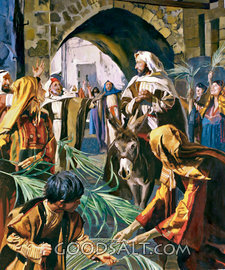 Today is call Palm Sunday because the crowds covered Jesus’ path with branches of palm leaves as He rode by on the donkey. It was a joyous welcome. The biblical account of Palm Sunday can be found in Matthew 21:1-11; Mark 11:1-11; Luke 19:28-44; and John 12:12-19. This took place to fulfill what (Zechariah 9:9) the prophet foretold five hundred years earlier. Great reminder Noel to start this special Sunday observation with. Have a blessed Palm/Passion Sunday! Thanks so much for stopping. Have a blessed day. Excellent post, Noel! I truly enjoyed it! May the Lord bless you, abundantly! Hello Minister Paulette! Thanks so much for stopping. I truly appreciate your comment. I sincerely hope you are doing fine. I thank God for saving me. He deserves everything we have, yet the only thing He ask is that we worship Him in spirit and in truth. Thanks so much for stopping and sharing your thoughts, my friend. God is worthy. May our lives (not just our words) be of continual praise to the One who gave His all for us.